Searching to combine a sense of cool, calm sophistication? Invigorate your open-air area with a fresh approach to outdoor living with the Puppy Outdoor Relaxing Chair with high-end coal cushions. Lounge furniture that is modern, chic and superior in style, the Puppy Relaxing Chair is an exceptional glimpse into a life of luxury… one that you deserve. 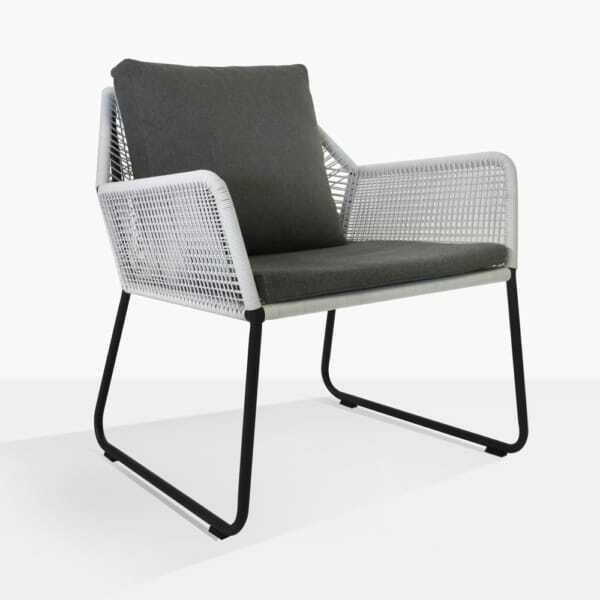 Framed on a sleek black matte aluminum frame, the Puppy Lounge Chair is then wrapped with strips of white outdoor wicker that crosses over in a satisfying geometric pattern, in keeping with light and airy Scandinavian furniture. The Puppy is then topped with a comfortable Sunbrella® pad for ultimate comfort and a finished design that will complement your outdoor space. 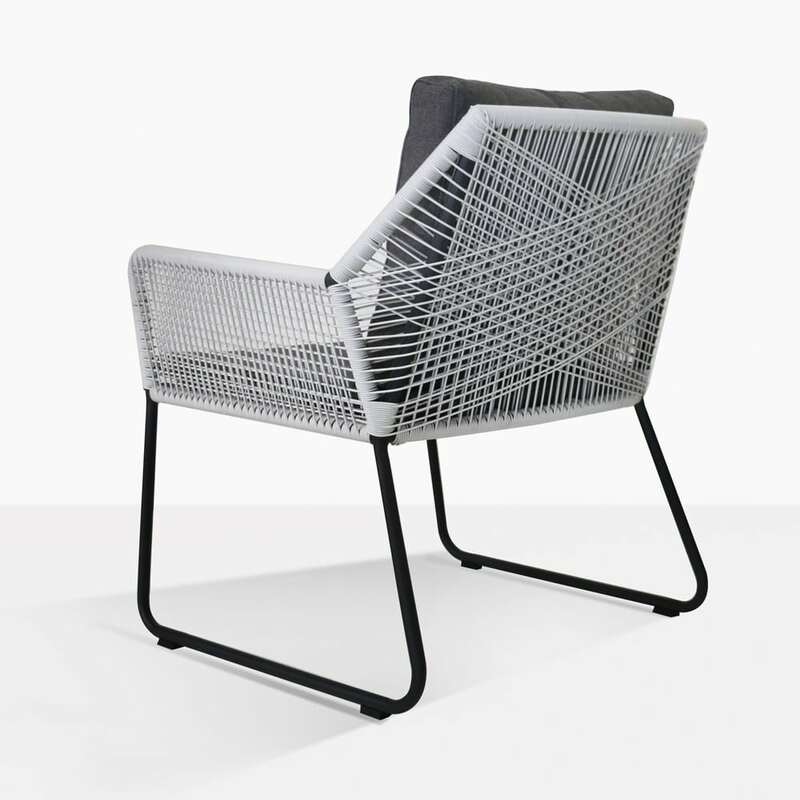 This is a chair that will freshen many styles of space with its simple and striking design. 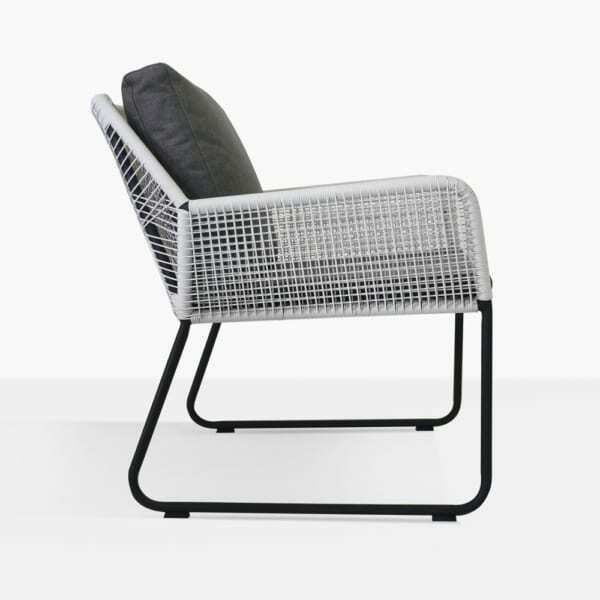 Whether you have a small patio, grand deck or large courtyard, the Puppy Outdoor Chair will fit in perfectly! Imagine your stark paved patio… it needs comfort and style and your personality. Place several of the Puppy Relaxing Chairs around a low round coffee table. Maybe you want to keep the look urban, in which case a concrete table would look fantastic with the lines of the Puppy Chair. Or if you’re tying a rustic look together, then purchase one of our amazing reclaimed teak coffee tables for a measured but eclectic look. 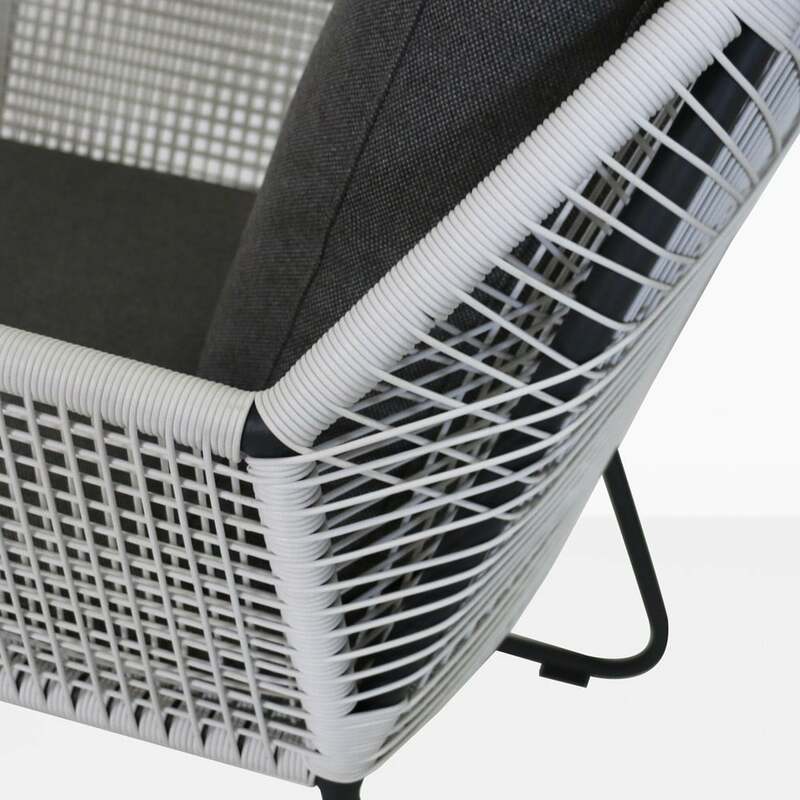 Similarly an apartment balcony will come to life with the Puppy Chairs side by side with an accent table of your choice – perfect positioning for evening cocktails or breathing in the morning air! The Puppy Relaxing Lounge Chair is made from high end products that surpass many others in quality and style! From the incredibly strong powder coated aluminum to synthetic UV treated and through dyed wicker to the wonderful, world-regarded Sunbrella® fabric on the cushion pad. Call Teak Warehouse today to order this opulent, relaxing and stylish piece of outdoor furniture.